A metal frame is necessary to suspend the vault in the center. 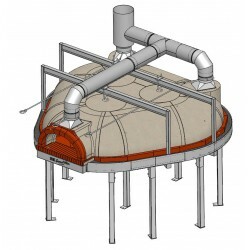 Thanks to this installation method, ovens can be made in very large sizes and in a variety of shapes . Vaults are made of chamotte concrete but on request, we can supply them in bricks as well. Technical data is available under "download"